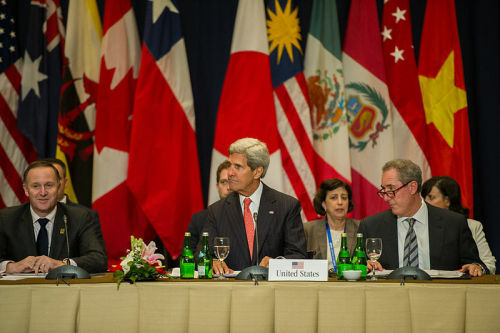 Secretary of State John Kerry participates in a meeting with nations’ leaders discussing the Trans-Pacific Partnership (TPP). Source: Wikimedia, U.S. Government Work. The United States is a Pacific power. For over 70 years, we have been the guarantor — and a major beneficiary — of peace, stability, and growing prosperity in the Asia-Pacific region. Public opinion polls show that Americans consider the region to be more important than any other to our nation’s future. And in Asia, surveys show that in the midst of uncertainty about China’s growing power, our allies and partners are counting on continued U.S. leadership in the region. U.S. security and prosperity in the Asia Pacific are underpinned by three pillars of our national strength. First, our network of bilateral alliances and our forward military presence in Japan and Korea reassure our friends and allies and deter potential adversaries who might threaten them or push security challenges across the Pacific toward our own homeland. Second, our values reinforce support for an open regional and global order based on rule of law and accountability to the governed. Today a majority of states in the region identify with these democratic norms — a striking fact given that democracy existed only in Australia and the Philippines when the fighting in the Pacific ended in August 1945. Third — and for many of our partners most important — is our commitment to expanding trade and economic cooperation. Americans learned in World War II that protectionist walls create dangerous blocs that fuel authoritarianism and weaken the positive influence of democratic norms and rule of law. In 1945, the United States pried open the closed trading systems of Japan and the former European empires in Asia and championed a new rules-based order based on the Bretton Woods system. The resulting explosion in trade and development did as much to stop communism as the sacrifices made by the American people in the jungles of Vietnam in the 1960s and ‘70s. More and more states defected from the Soviet bloc and entered the prosperous new regional order backed by the United States and our allies. Victory over the Soviet empire was made possible by these three pillars of American strength. The U.S. military and our allies contained Soviet military expansion; the spread of democracy in the 1980s dried up the swamps of potential communist revolution from within Asian states; and opening markets created a regional order that was impossible to overturn and too prosperous for former Communist bloc states to ignore. It is critical to understand that alliances, the spread of democratic norms, and growing economic openness and prosperity meant that the United States did not have to guarantee stability alone. As the world economy expanded and the U.S. share of global gross domestic product (GDP) declined from 50 percent to 25 percent between 1945 and 1975, American leadership and the community of nations allied or aligned with the United States actually expanded. Today power is shifting in Asia again. There is a competition for power and influence and a collision of norms and rules. And once again American leadership in defining an open economic order will ensure that the United States does not have to act alone to ensure access to markets in Asia for our goods and services and to protect the Pacific Ocean against threats that might emanate from within Asia. The Trans-Pacific Partnership (TPP) is the single best assurance we have that the United States will lead a broad coalition of like-minded states committed to reinforcing the rules-based order in Asia. TPP is a comprehensive, high-standard trade agreement that brings together 12 Asia-Pacific economies representing some 40 percent of global GDP, including four key partners in the Western Hemisphere — Canada, Mexico, Chile, and Peru — to tear down market-access barriers and establish new rules on regional trade and investment. TPP promises significant economic benefits for the United States. Once ratified and fully implemented, the agreement is expected to produce income gains for the United States on the order of half a percent of GDP. Most of the benefit would come from an expansion of higher-value exports and delivery of sophisticated services to the Asia Pacific. Foreign direct investment into the United States is also likely to grow substantially, with the prospect of new jobs for Americans. In addition to cuts in tariffs and other barriers to trade at the border, the agreement will establish new rules that make it easier for American companies and workers to compete in the global economy. Among other things, these will better protect U.S. intellectual property and enable freer cross-border data flows, establish the first-ever disciplines on state-owned enterprises, and require stronger labor protections in emerging economies like Vietnam. Indeed, TPP will decisively put the United States and our allies and partners at the center of rule making in the Asia Pacific. There are other trade and economic groupings taking shape in the region. China has established an Asia Infrastructure Investment Bank (AIIB); Asian states are negotiating a Regional Comprehensive Economic Partnership (RCEP) that does not include the United States; Japan, Korea, and China are discussing a trilateral free-trade agreement. With TPP and continued American economic leadership in Asia, these new institutions and groupings are far more likely to aspire to the higher levels of ambition, discipline, and openness that the United States champions. That is the hope of our closest allies such as Japan and Korea as they discuss these other economic arrangements. Absent TPP and American leadership, however, these other groupings and institutions will steadily begin defining rules for trade and investment in the Asia Pacific—likely with far lower standards. TPP is already creating a powerful gravitational pull on other countries in the Asia Pacific that do not want to lose out on the agreement’s economic benefits and understand the value of high-standard rules for their own progress. Leaders from Korea, the Philippines, Indonesia, and Thailand have all expressed interest in joining, and even China is assessing whether it can meet TPP’s high standards. At a time when China faces a challenging economic transition and desperately needs market-based reform, TPP could encourage a more open and rules-based Chinese economic policy. In every major Asian capital — friendly or not — the question is being asked whether the U.S. Congress might actually walk away from an agreement that forces far greater opening in their own economies than in ours and that so clearly serves American economic and security interests in the region. Failure to ratify TPP would raise the most fundamental questions in these governments about whether the United States understands what is really at stake in the new Asia that is emerging. The impact on the U.S. economy would not be comparable to the Smoot-Hawley tariff in 1930, but the strategic signal would be almost as damaging to American strategic credibility. Trade negotiations are difficult and excruciating. No deal is perfect. With any trade agreement, there are adjustment costs to individual firms and workers, but given the broad gains of TPP to the economy as a whole, we have space to address these costs directly — and should. Most Americans understand the broad benefits the agreement will bring: in a recent poll by Pew, over two-thirds say they support trade. Those who would reject TPP should not overlook the lost opportunities for U.S. exporters, workers, and consumers, nor the geopolitical signal that rejection would send to the region and the world about American leadership and competence. At a time when America’s allies and partners in Asia have grown wary of overdependence on China, Washington has a chance to demonstrate that the last 70 years were not an anomaly and that the United States is committed to remaining engaged in Asia-Pacific affairs as champion of a rules-based order. Just as it has been throughout history, order in Asia has been defined not only by military power but also by trade. TPP offers a rare opportunity to update and uphold the rules that underpin that order, on terms that serve U.S. interests and win the support of our allies and partners. Dr. John Hamre is president, CEO, and Pritzker Chair at CSIS. Dr. Michael Green is senior vice president for Asia and Japan Chair at CSIS. Mr. Matthew Goodman is senior adviser for Asian economics and Simon Chair in Political Economy at CSIS. Mr. Scott Miller is senior adviser and Scholl Chair in International Business at CSIS. Mr. Ernest Bower is a nonresident senior adviser at CSIS. Victor Cha is a senior adviser and Korea Chair at CSIS. Mr. Christopher Johnson is a senior adviser and Freeman Chair in China Studies at CSIS. Mr. Michael Matera is a senior fellow and director of the Americas Program at CSIS. Mr. Richard Rossow is a senior fellow and Wadhwani Chair in U.S.-India Policy Studies at CSIS. This article was originally posted at cogitASIA, a blog of the CSIS Asia Program.